Happy New Year! There has been a bunch of craziness going on in the world of Skylanders. New Skymiibo Dual packs, Kaos Trophy single pack, possible Dark Edition Dual packs being released, Birthday Big Bubble Pop Fizz, and BATTLECAST! I’ll be posting more info about this stuff later. Skylanders Inquirer and Myskylanders.de have been running some wonderful Skylanders news articles giving us a bunch of info about what’s coming. Check them out when you can. 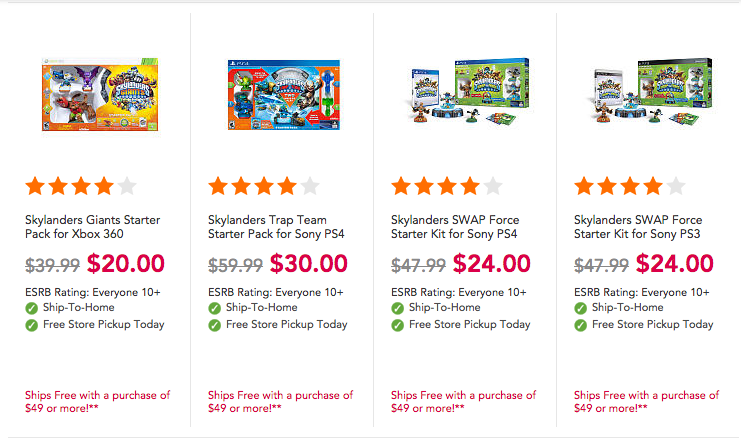 I wanted to give you all a heads up about the new Skylanders day at Gamestop. Here is a look at all the deals you can find that day. 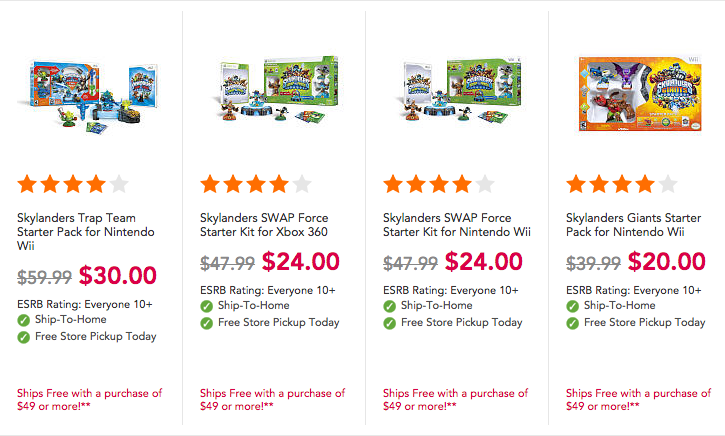 These are some sweet deals on Skylanders stuff great time to get things you are missing until the new wave is released. Until next time i’ll catch you on the SKYSIDE! Skylands is abuzz with the holiday spirit and ready to supercharge kids’ holiday wish lists with special toys, a newSkylanders® SuperChargers Racing Action Pack, Skylanders merchandise, BlackFriday deals and more. 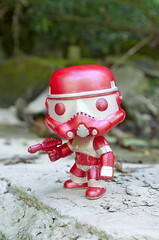 Activision Publishing is kick starting the season by releasing a special holiday variant Missile Tow Dive Clops. The fun-loving character is a heavily armored deep-sea explorer with an eye out for evil who slows enemies with candy-coated missiles. Missile-Tow Dive-Clops is available in Europe in late November, and in the United States and Canada onDecember 2, first at GameStop and EB Games, respectively. As you know Eon’s Elite figures have been released at Toys R Us and they look awesome! The first three have already been released Slam Bam, Zook, and Voodood. The last three are coming at the end of November (more details below). Also available for the holiday season at Toys”R”Us® stores nationwide and online at www.Toysrus.com is the premium toy line Eon’s Elite, including fan-favorite characters Slam Bam, Zook and Voodood, as well as a new set of heroes — Ghost Roaster, Boomer and Dino-Rang — available first at Toys”R”Us beginning onNovember 29 ($19.99 MSRP). Also being released is the second racing pack, which is for the Sky Terrain featuring Astro Blast, the Sky Runner, and the Sky Trophy that will unlock new tracks. Fans also can get their hands on the second Skylanders SuperChargersRacing Action Pack, now for Sky terrains ($34.99 MSRP). The Sky Racing Action Pack takes Skylanders racing to new heights featuring Astro Blast and Sun Runner, as well as a Sky trophy which unlocks new tracks and modes. Astro Blast, the adventurous space cowboy, is SuperCharged and ready to take on the bad guys in his Sun Runner spaceship, fully equipped with anti-gravity and speedy capabilities. Skylanders Superchargers is definitely going to be a hot item this season! 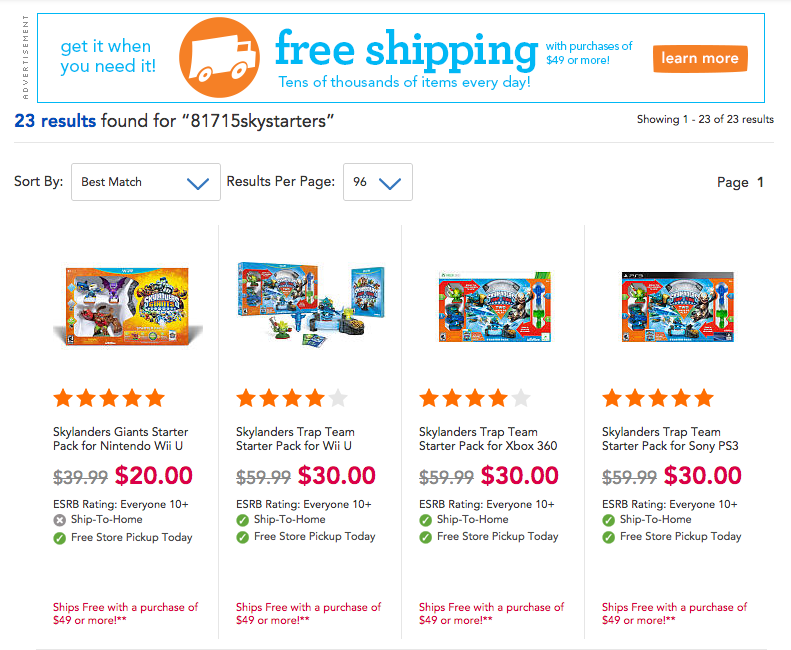 Skylanders SuperChargers has been named to the Toys”R”Us 2015 Hot Holiday Toy List, the Amazon Holiday Toy List and Toy Insider’s Hot 20 Holiday Toys List. 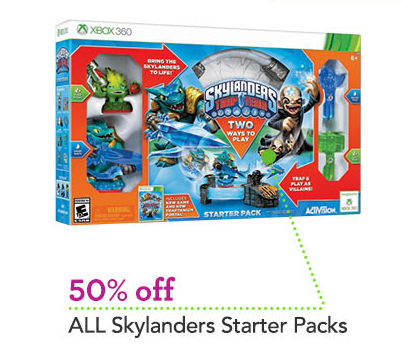 Fans won’t want to miss out on special BlackFriday deals on Skyanders SuperChargers Starter Packs, offered at $39.99 MSRP at participating retailers. Nothing says holidays like the Macy’s Thanksgiving Day Parade! Skylanders‘ very own Eruptor is taking flight in the iconic parade this Thanksgiving. With his 25-foot smile, Eruptor will soar above the streets of New York City for the landmark holiday event for his second year in a row, cementing Skylanders as a true pop-culture phenomenon. 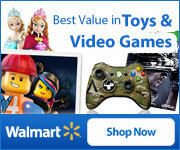 Skylanders hats and gloves set by ABG Accessories; Skylanders-themed Crayola Color Alive coloring books; Skylanders comic books by IDW Publishing, and more. Skylanders SuperChargers expands upon the franchise’s signature gameplay to introduce vehicles-to-life, an entirely new way for fans to experience the magic of Skylands. The game offers a rich story-driven gameplay experience filled with vehicle-based and on-foot adventures, combat, puzzles, mini games, activities and platforming, set within a variety of all-new compelling environments. SkylandersSuperChargers is forward compatible with all 300+ unique toys from all previous games – Skylanders® Trap Team, Skylanders® SWAP Force™, Skylanders® Giants andSkylanders® Spyro’s Adventure. 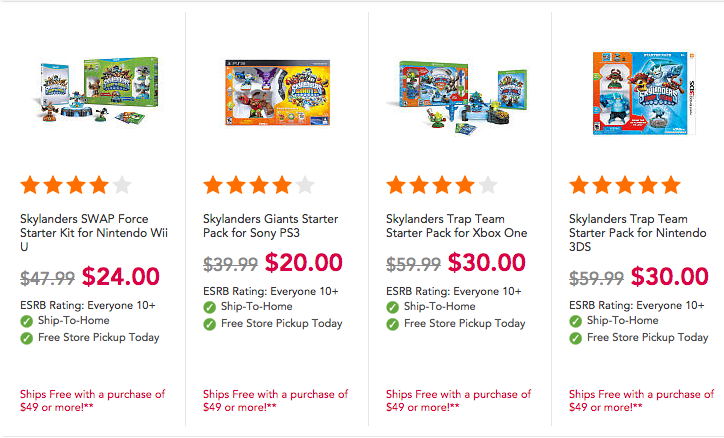 Skylanders SuperChargers is available for the PlayStation® 3 and PlayStation® 4 computer entertainment systems, Xbox 360™and Xbox One™ video game and entertainment systems from Microsoft ($74.99 MSRP). The game includes two of Nintendo’s iconic characters reimagined as Skylanders — Turbo Charge Donkey Kong and Hammer Slam Bowser — available exclusively in Skylanders SuperChargers Starter Packs for the Wii U system ($74.99 MSRP), and inSkylanders® SuperChargers Racing Starter Packs for the Wii system ($74.99 MSRP) and the Nintendo 3DS family of systems ($64.99 MSRP). For more information be sure to visit https://www.skylanders.com/ or follow them on Instagram @SkylanderstheGame, Twitter @SkylandersGame and Facebook.com/SkylandersGame. 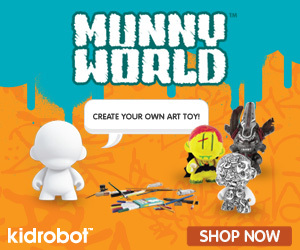 Also don’t forget to visit our pages on all the above mention sites @SkylanderAddicts. Until next time I’ll catch you on the SKYSIDE! This is a quick update on the black friday deals that are coming up. 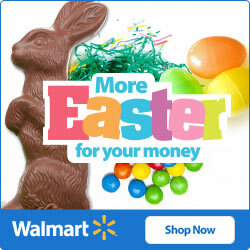 Take a look below to see where to get the best bang for your buck! For all of you Skylanders comic book collectors this is for you. When I find more deals I’ll let cha know. If you missed the first set of deals you can see them by clicking the link below. Until next time I’ll catch you on the SKYSIDE! Halloween is just right around the corner so have you thought about costumes yet? If you are looking for some cool costume ideas check out costumeexpress.com they have an awesome selection of costumes especially Skylanders themed ones for all the Portal Masters out there. I personally like the Snap Shot and Kaos costumes would be cool if I could find a Kaos costume in my size lol! 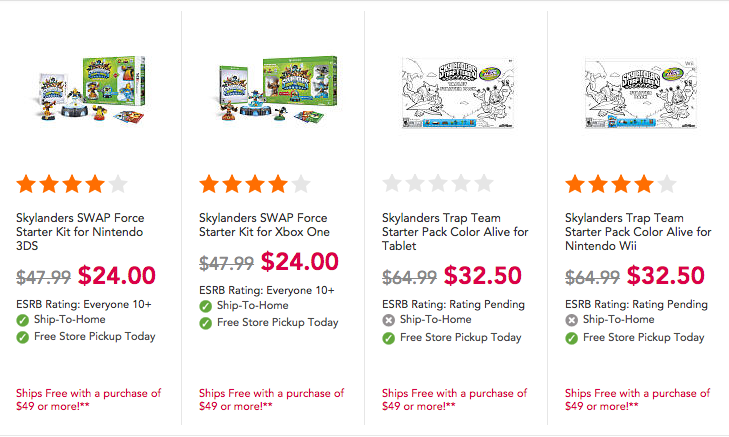 If you do decide to make a purchase take a picture of what you got and tag us by using the hashtag #SkylanderAddictsLoveCostumeExpress so we can share your awesomeness. BOOM! Until next time catch you on the SKYSIDE! Source via: Team Up and Dress Up with these Skylanders Costumes! – Halloween Costume Ideas and Tips for Kids. This is just a heads up for all of you all that are playing catch up on figures and starters. 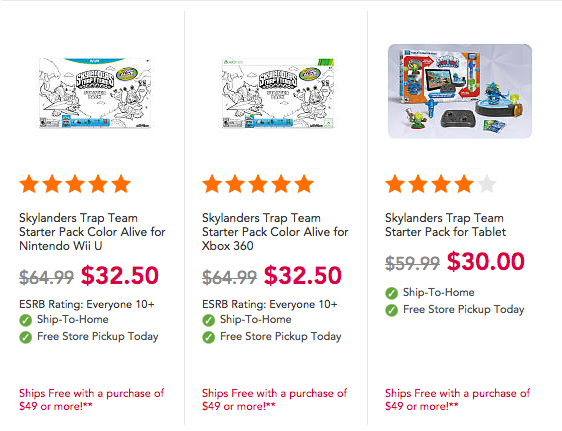 Toys R Us is having a great sale now all starter packs are 50% off! That’s right 50% off! Hope this helps out until next time I’ll catch you on the SKYSIDE!